Pikachu is a Pokémon, from the game and series of the same name. Arguably the most popular of Pokémon, Pikachu is the newest (in terms of time since conception) character in Super Smash Bros. Although he has relatively short-range throws and tilts, and a very slow/weak dash attack, Pikachu is arguably one of the best characters in the game. He has high attack priority and range in the air, insanely fast recovery times (whether from being attacked or attacking), he has the best back-to-stage recovery in the game (if done right), and can combo like mad. He is also known as "Pika." 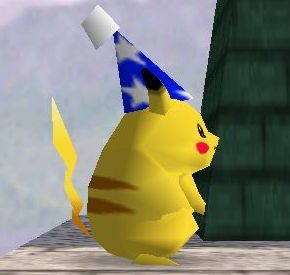 If there are other Pikachus, or during a team battle, the Pikachus will wear different coloured hats instead of changing color. Short start-up and cool-down times. Disjointed hitbox on forward smashes. High aerial priority and range. Thunder ( + ) makes killing off the top easier. Best mobile edge-guarder in the game. Best overall recovery in the game. Has a projectile (two different trajectories, and it goes around corners). Slow acceleration into run (slower dash-dance). Short-range, relatively low priority neutral air attack. These are Pikachu's physical attacks, done with and modified with . Pikachu headbutts the air (or the opponent if you're close enough). Though it is possible to back your opponent up against the wall with this, its cool-down time is too slow for the normal use of a jab. It is possible to shield grab your opponent if you have backed them up against the wall with this move. Simply hold while continuing to pound , and then throw them when you grab them. He's a bit chubby, so he just throws himself onto the ground head-first in hopes of sliding into the opponent and stabbing them with his party hat. Because he throws himself on the ground and has to get up again, the cool-down time is ridiculous, and the knockback is not worth the vulnerability. This is not a very useful move. After grabbing an enemy you have the choice of throwing them the direction you're facing, or the opposite way. Pikachu's not very powerful, so don't expect a forward throw to finish a fairly healthy enemy. However, if you throw in the opposite direction, Pikachu will flip the enemy onto his back, electrocuting them before shooting them off in a more powerful throw. This makes Pikachu drop to all fours and swing his tail in a nearly 90° arc over his head. This is a great combo starter, as it bounces your opponent nearly straight up, with a small angle to whatever side of you the opponent is on. It has awesome priority and just enough knockback to stun the opponent and bounce them without letting them escape. This is a juggle move, if you really want to stand in place and up tilt about 5 times. Use it to get your opponent up in the air so that you can combo them. It's also good to bounce them up as a set-up for a upward smash, if you're going for a kill. It's also good because its high priority allows you to stop attacks coming from above (not all, mind you - Link's downward air attack will still hurt you if you try this) and turn them into a combo of your own. You can also hit people in front and behind you with it because of its arc. This makes Pikachu drop into a crouch and turn around to put his tail out in front of him at ground level. The warm up time is just a hair longer than one would expect, but the rest of the move is pretty quick. You'll find the most use for it in edge-guarding, as it sends the opponent down and away at a slight downward angle, and has decent knockback. It can also be used as an interrupter against combo-starters, and it actually has a bit more range. Pikachu will put all of his weight on his front two paws and kick out in the direction that you pressed with both of his rear paws. This attack has relatively short range, but it is fast and has acceptable knockback for a tilt. Use it to interrupt an incoming throw like you would with a jab if you were any other character, or move your opponent a little bit to the side as a set-up for a combo. This move is also great if your opponent is moving in and out of your range, trying to get you to slip up. Because it's so fast, you can make it seem as if you've let your guard down but when they come in to take advantage, tap them with the forward tilt and follow up with a forward air or upward air combo. This is a strong move. He does a backflip, swinging his tail in a powerful vertical arc through the area (and hopefully the enemy) in front of him. This is one of Pikachu's killing moves. It can be used to juggle at low damage on heavy characters when an upward tilt isn't powerful enough, but you're going to want to try to use it for the kill. It kills on normal-sized characters at around 80%-100% (usually), and has pretty good range in front of Pikachu. Once you work up the damage, an upward tilt is the perfect setup for the upward smash, or a forward throw into a wall, or simply a dash-dance to an upward smash. Pikachu spins around on the ground breakdance-style, hitting any opponents on the ground immediately to either side of him. Nice low warm-up time, acceptable cooldown time. Great for screwing up rollers; other than that, of limited use. You'll notice, if you look closely enough, that Pikachu's cheekspots turn blue when doing this move (maybe he's holding his breath). Pika charges up his energy for a moment, and then spits a solid bar of energy out in front of him. This chunk of electricity stays there for about a half-second, so anybody running into its hitbox (which is quite a bit larger than one would think) will be hit by it as long as its still out there. This is one of Pikachu's edge-guards, as it has fantastic knockback and stays out in front of you for long enough that its harder for your enemy to throw off your timing and avoid it. It should very rarely be used when in combat on the stage, unless it's in a special situation (i.e., to throw off your opponent or as an unexpected combo finisher). Its primary use remains as and edge-guarder. Pikachu flips backward and kicks upward striking enemies on both sides and above. Pikachu does a barrel roll while moving down vertically, zapping enemies below. Strong attack with longer cooldown. Pikachu does a barrel roll and repeatedly zaps forward. It knocks enemies into the air at the end of the move and is an excellent combo starter. Pikachu kicks backward knocking the enemy a fair distance. Good end to a combo. In this attack, Pikachu sends out a wave of electricity that bounces off of the ground and can move down the sides of walls. This is an effective long range attack if your opponent is falling to the ground, good to use in combination with Pikachu's grab move. This move is the perfect second jump. Pikachu moves in the direction you push , and it is possible to make him move twice if you can time it right. The attack does no damage, but it can move Pikachu far away from combat and is extremely helpful for getting back onto the platform when you are off the edge. Note that Pikachu cannot move twice in the same direction. However, small adjustments to the angle can offer small bonuses to distance (e.g. move right, then diagonally up and right). Also, moving downwards or diagonally downwards into a solid platform can be a better tactic than moving diagonally upwards and having to wait for Pikachu to fall back down. Any extra time spent in the air can be dangerous. This move can be extremely powerful, but must be used with caution. When used, Pikachu calls down a lighting bolt that hits wherever he is standing while he is using it. If your opponent is standing right next to you, the attack is powerful. It can also be used in combos if your opponent is up in the air directly above you, because it will hit him while he is up there. Be careful of using this attack when you are underneath a platform, because it will strike the platform above you, not where you are standing. Also, this attack is incredibly slow and it is easy to shield/roll away from so use this attack with caution. It's best used in battle against multiple opponents while they fight each other close together. This page was last edited on 18 May 2015, at 02:16.